Gladwell is masterful at taking a concept and making his point by wrapping it in a series of compelling stories that makes that point very sticky. 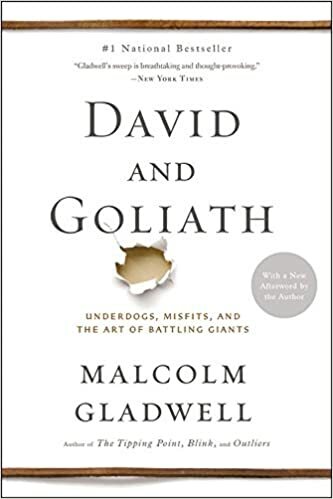 I wouldn’t call David and Goliath his best but it is still a wonderful read and has plenty to teach. The central concept is that you should never take on the Goliath where he is strongest. If you take the battle to the giant, don’t let the giant dictate the terms and certainly don’t try to beat the giant at their own game. Instead, change the game and turn their greatest strength into a weakness. Yes, very Sun Tzu. What is most fascinating about Gladwell’s approach is he spends time showing you how the underdog beats the super power and it’s very rarely for the reasons that you may think. Gladwell kicks us off by diving into war. He asks the question: “What happens in wars between the strong and the weak when the weak side does as David did and refuses to fight the way the bigger side wants to fight, using unconventional or guerrilla tactics? The answer: in those cases, the weaker party’s winning percentage climbs from 28.5% to 63.6%.” This makes it very obvious that the underdog can have the advantage as long as they are willing to change the rules. Most of the time, they don’t change those rules. Why? Gladwell goes on to state that: “to play by David’s rules, you have to be desperate.” And if you are desperate enough you might be willing to put in the hard work to change the rules. The fact is, desperate, underdog strategies that have any chance of success come from a hell of a lot of hard work. Underdogs rarely win because of luck. He next takes us into the concept of the inverted-U curve. 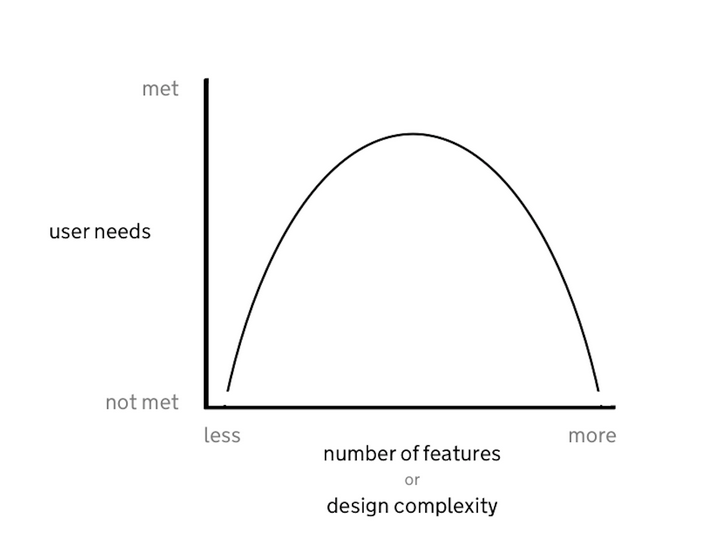 “Inverted-U curves have three parts, and each part follows a different logic. There’s the left side, where doing more or having more makes things better. There’s the middle, where more doesn’t make much of a difference. 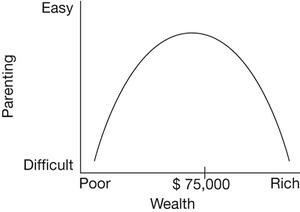 And there’s the right side, where doing more or having more makes things worse.” This curve in many ways is the central tenant behind the book. It can be applied to almost any discipline in life. Gladwell discusses it in the context of parenting and class sizes but this is easily extended into all walks of life. A quick search on the internet shows tons of examples but the central concept brings us back to a saying that many have used but few have explained so thoroughly than Gladwell and that is: in many cases, less is more. The next topic he takes us into is desirable difficulties. Gladwell uses dyslexia as an example of one of these desirable difficulties. One of his interviewees makes the statement, “The one trait in a lot of dyslexic people I know is that by the time we get out of college, our ability to deal with failure was very highly developed. And so we look at most situations and see much more of the upside than the downside. Because we are so accustomed to the downside.” Because of these desirable difficulties, it gives those folks that get put through the ringer the ability to be a little more disagreeable. Being disagreeable is one of the pre-requisites to challenging the status quo and the first step in changing the rules. The concept of the inverted-U curve comes up again in his explanation of the principle of legitimacy in the context of power imposed on the people. The principle of legitimacy is based on three things, “First of all, the people who are asked to obey authority have to feel like they have a voice – that if they speak up, they will be heard. Second, the law has to be predictable. There has to be a reasonable expectation that the rules tomorrow are going to be roughly the same as the rules today. And third, the authority has to be fair. It can’t treat one group differently from another.” Some of our most turbulent periods in history were when the law is applied in the absence of legitimacy. This doesn’t produce obedience, this produces backlash. Gladwell nicely sums this up in the context of prison and Ireland’s times of trouble. He summarizes with the Vietnam war. One of his quotes here nicely ties the theory behind the book up with a bow, “It was not that the Viet Cong thought they were going to lose. It was that they did not think in terms of winning and losing at all – which was a profoundly different proposition. An enemy who is indifferent to the outcome of a battle is the most dangerous enemy of all.” This is what underdogs do, they change the rules. They disrupt. And when they do, they often win. Read it, it’s worth your while. In So Good They Can’t Ignore You, Newport takes one of the common American ideals that ‘following your passion’ will make you happy and completely blasts it out of the water. 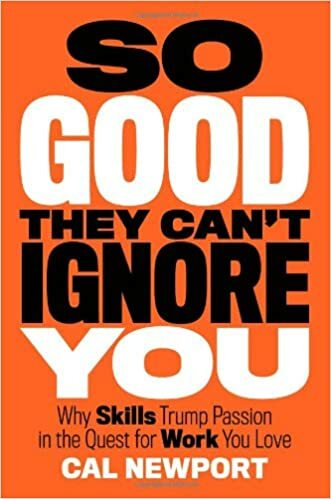 The quote, ‘be so good that they can’t ignore you,’ was taken from Steve Martin who is truly one of the hardest working comedians in the business. Martin’s point, and Newport’s point throughout the book is that passion is actually a side effect of becoming really good at your job. If you can develop a skill set that is rare and valuable, you are going to find that passion will become a side effect of being really good. However, if you just follow a passion without developing any skills, you are in for a life of disappointment. This is an excellent study into an American mythos that has caused so many people so much pain and discontent. Newport asks and answers the questions of why is following my passion a bad idea? If I shouldn’t follow my passion, what should I do? How do you actually get so good they can’t ignore you? The author takes a clinical, scientific approach to bringing his points across. He starts with some stats that poke a serious hole in the follow your passion. He cites a 2002 study that states that, “Less than 4% of the total identified passions had any relation to work or education, with the remaining 96% describing hobby-style interests such as sports and art.” This bursts the passion bubble pretty quickly because if your passions are not relevant to making a living, the passion advice can rapidly become a one way ticket to destitution. However, another survey showed that, “the strongest predictor of an assistant seeing her work as a calling was the number of years spent on the job. In other words, the more experience and assistant had, the more likely she was to love her work.” This was obviously just a subset of workers in the world, but this seems to touch on a universal truth, as Newport states, “Passion is a side effect of mastery”. So how do you earn it? This is where Newport introduces the idea of career capital. You build career capital by tons and tons of deliberate practice. Deliberate practice goes back to the 10,000 hours magic number that Malcolm Gladwell made the focus of his book Outliers. The problem is that deliberate practice is very different from just showing up and working hard, “if you just show up and work hard, you’ll soon hit a performance plateau beyond which you fail to get any better.” Deliberate practice is not the fun stuff that you are comfortable with, it is getting outside of your comfort zone and stretching yourself to get better. That’s why people hate to do it because it is not fun but it is also the key to becoming excellent. Newport moves into other concepts in the book, like the importance of having a mission but I derived the most value out of the career capital idea. This concept of deliberate practice is not new. What I’ve always struggled with is how to actually put it into practice. If you are learning an instrument or picking up a new sport, the blueprints of practice are somewhat obvious especially if you have a good teacher. But what if you’re a VP of a software development firm, or a manager of a sales organization? How do you deliberately practice those skills?